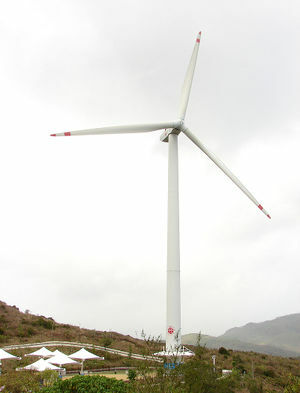 The Wind turbine is the modern day windmill which is marketed as a clean energy solution to replace power from fossil fuel, coal, and nuclear power plants. The addition of multiple wind turbines in the same geographical location is referred to as a wind farm. The sales pitch goes as follows, "wind turbines power millions of homes with wonderful 'free' energy". The truth is a much different story. "The wind power industry claims switching from conventional power to wind power will save consumers money and spur the economy. However, data from the top 10 wind power states show just the opposite." There is a good deal of controversy over whether wind power is a good idea as a viable energy source. This should come as no surprise—energy is big business. A significant fraction of a nation's wealth goes into providing energy, and the energy companies (oil, gas, coal, nuclear, hydro, wind) have a lot at stake. They devote a lot of their resources into promoting their interests. As a relative newcomer to the field, and with a lot of technological advances going on, it's no surprise that wind power comes in for a lot of praise and criticism. Wind energy from turbines is a power generating loser when compared to other technologies such as coal, hydro, gas and nuclear. One major downside is that when there is no wind, no power is generated. Sources say you need at least a 10MPH wind speed to generate power, and speeds in excess of 50MPH will shut down turbines to prevent damage. Industry promoters often paint a rosy picture of the benefits of wind power when other sources claim as little as 8% of usable generation. It is not widely known that wind turbines actually use electricity from the grid (coal/gas/hydro/nuclear) to power their hydraulic systems that keep the blades facing in the same direction as the wind. In freezing weather conditions, electricity from the grid is used to keep the blades spinning at low speeds as a method of de-icing. The misconception is that you install a wind turbine and it will pay itself off within a decade. From that point out, it is a net energy gain at a fraction of a cost. Nothing can be further from the truth. Constant costs are involved in maintaining these mechanical structures; Overheating bearings, plastic that melts, gallons of brake oil leaking, gallons of hydraulic fluid leaking, blades that fall off, towers that collapse, replacement of yaw gear drives, bearings, gearboxes, brushes, and generators. The cost to put out wind turbine fires is also substantial. Some can self-extinguish small fires, but others need fire departments to extinguish turbines and put out the brush fires sometimes caused below. The cost to manufacture wind turbines prevents any offset gained transitioning to a 'clean' energy environment. Landscape, seascape, and wildlife costs are a major downside to power from wind. Eagles, bats, and birds of all kinds are killed in the thousands by wind blades. Estimates place the number of birds killed by wind turbines at 30 million per year. In Ontario Canada, every turbine destroys 3 acres of land, roughly 21,000 acres of farmland. Many people living within 2 km (1.25 miles) of these spinning giants get sick says a peer-reviewed study by the Johns Hopkins University School of Medicine. Low-frequency noise and infrasound appear to be the chief disease-causing culprit according to Dr. Nina Pierpont. In Wisconsin, a study showed noise emanating from the turbines was detectable inside homes within a 6.2-mile radius of the industrial wind plant and declared wind turbines a health hazard. Billions of taxpayer dollars are being shoveled into this inefficient scheme in order to promote Global Warming agendas at the expense of real power sources and the tens of thousands of jobs they replace. Government subsidies keep the growth of wind turbine construction alive and keep this technology running after installation. Without government financial involvement, wind turbines become too costly to operate, go idle and start rusting the landscape. Without government funding, investors sell their investments and shelve plans to expand. The UK's Labour party insists that wind turbines can't make a profit without subsidies. Tax credits are given to companies that manufacture, to companies that install/maintain, to municipalities that own the property. The IRS is giving away $13 Billion per year in wind energy subsidies. The world's biggest billion dollar corporations, such as General Electric and Siemens, are reaping the investments made in subsidized wind turbine construction. The U.S. government has laid the groundwork for an endless welfare system devoted to big wind companies. This page was last modified on 9 April 2019, at 19:39.